EUGENE, Ore. – No. 25 Baylor volleyball (20-8) found itself down 2-0 and 18-14 in the fourth set, but the Bears grinded out a five-set thriller over Hawai’i (18-9) in the NCAA First Round Thursday at Matthew Knight Arena in Eugene, Ore., 23-25, 23-25, 25-14, 26-24, 16-14. Baylor is headed to the NCAA Second Round for the third consecutive season and captured its third-straight 20-win season under head coach Ryan McGuyre. Shelly Fanning led the Bears with 18 kills and posted a career-high 10 blocks for her first career double-double. Yossiana Pressley put down 17 kills, and Aniah Philo had her 13th double-double of the season with 14 kills and 21 digs. Philo and Gia Milana also posted their 1,000th career kill in the match, combining for 21 on the outside. Baylor came out fast against the Rainbow Wahine and took a slim 15-13 lead at the media timeout. Baylor led 19-14 after back-to-back Pressley kills, but the Rainbow Wahine would tie it at 23-23 with a kill. BU closed out the frame on two attack errors, falling 25-23. Hawai’i kept the momentum to start the second frame and led 23-15 before the Bears went on a 7-0 run to pull within one at 23-22. BU saved a set point with a Pressley kill, but Hawai’i closed it out for the 2-0 advantage, 25-23. BU fired back in the third frame and led 19-10 following a Philo kill. Baylor closed out the set on a 4-1 run to climb back into the match, 25-14. The Bears found themselves down 18-14 in the fourth frame after a Rainbow Wahine block. Baylor jumped in front at 22-21 and used a block to force a fifth set, 26-24. Baylor jumped in front, 4-2, but gave up a 4-0 run to fall behind by two. Baylor climbed its way back into the set and took the lead at 12-11 with a Philo kill. 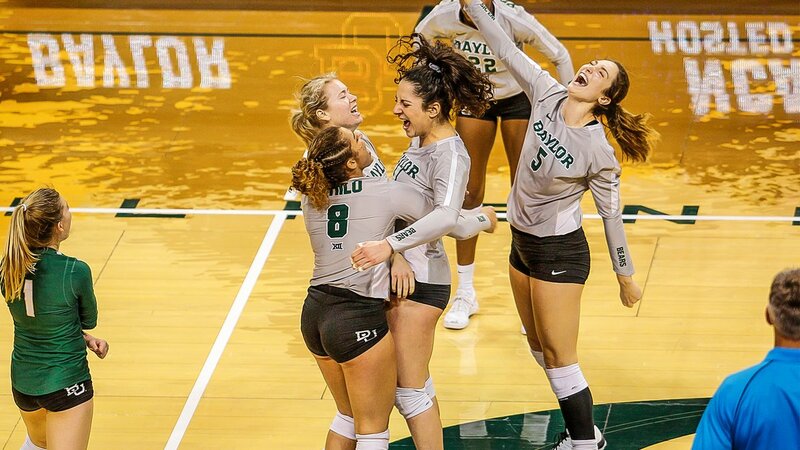 Hawai’i took a 14-13 lead to force a Baylor timeout, but the Bears rolled off three consecutive points on the right side to end the match, 16-14. • The Bears clinched its third-straight win in the NCAA First Round and are now 6-6 all-time in the NCAA Tournament. • Baylor stormed back from a 2-0 deficit for the second time this season but for the first time in postseason play, previously 0-5. • Baylor has its third consecutive 20-win season for the second time in program history (1991-93). • Baylor is now 3-2 in NCAA tournament matches under Ryan McGuyre. • Baylor collected its first-ever win against Hawai’i, improving to 1-6 all-time against the Rainbow Wahine. • Baylor has won a postseason match for the third consecutive season. • Shelly Fanning posted her first career double-double with 18 kills and a career-high 10 blocks. • Fanning is the ninth player in Baylor history to record a postseason double-double. • Yossiana Pressley posted her 25th double-digit match with 17 kills. • Aniah Philo collected her 1,000th career kill against the Rainbow Wahine, finishing with 14 kills and a team-high 21 digs. • Gia Milana collected her 1,000th career kill against the Rainbow Wahine on match point, finishing with seven. • Shanel Bramschreiber tied a match-high two service aces Thursday night. • Baylor is 14-7 as a ranked team in 2018 and 23-10 as a ranked team under McGuyre. • The Bears are now 4-0 in five-set matches in the postseason. 10 – the career-high block count by junior Shelly Fanning. The Bears (20-8) face 15th-seeded Oregon Friday at 9 p.m. CT at Matthew Knight Arena in Eugene, Ore.
BU looks for its second-ever win in the NCAA Second Round and a chance to return to the NCAA Sweet 16 for the first time since 2009. EUGENE, Ore.—The University of Hawai’i women’s volleyball team (18-9, 14-2 Big West) pushed No. 25 Baylor as far as possible, but was unable to complete the upset in the NCAA Tournament First Round. The Rainbow Wahine fell in a heart-breaking five-set, reverse sweep loss to the Bears, 23-25, 23-25, 26-24, 25-24, 26-24, 16-14. Senior libero Tita Akiu played inspired defense and recorded a Hawai’i single-match program record (rally scoring) of 34 digs. Junior setter/hitter Norene Iosia recorded her fifth triple-double of the season, while seniors McKenna Granato and Faith Ma’afala both concluded their collegiate careers by each posting double-doubles at the Matthew Knight Arena on the University of Oregon campus. Akiu was flying all over the court on defense. The senior transfer from Texas Tech bettered the former record set by Melissa Villaroman of 33 digs in a five-set match against Fresno State in 2002. Akiu finished her one-year career at UH with 465 total digs in 100 total sets played in UH’s 27 matches this season. That ranks her at No. 4 in UH’s single-season record book for digs, leapfrogging Elizabeth Ka’aihue‘s mark of 444 digs in 112 sets played in 2007. Akiu also passed former UH greats Teee Williams and Sarah Mendoza who both had 437 digs in 1988 and 2014 respectively. Iosia, UH’s dual-threat setter/hitter notched her fifth triple-double to go with her 15 double-doubles this season. She tied Granato with a team-high 11 kills with 14 assists and 15 digs. She was also in on three blocks. Granato finished her four-year Rainbow Wahine career with a match-high 11 kills plus 10 digs for her 12th double-double of the season. She finished her career with 1,055 total kills which ranks her at No. 19 in the UH career record books. Granato filled her stat line with two blocks, two service aces and one assist. Fellow senior, Faith Ma’afala notched her 10th double-double of the year. The setter logged a team-high 26 assists with 15 digs. She also added two service aces. In just her sixth start of the season, sophomore middle hitter Skyler Williams proved to be a force at the net, rejecting a team-high seven blocks (two solo), which was a season-high for Williams. She also added four kills and had one dig. In the first set, Hawai’i was battling the Bears, but after taking a 1-0 lead to start the match, UH wasn’t able to lead again, until they went up 24-23. Baylor led through much of the first set, but UH tied the set at 12-12 and 13-13. From that point, Baylor went on a 6-to-1 run to take a five point lead at 19-14. Hawai’i, in turn, countered with a 6-to-1 run of their own to tie the frame at 20-20. The Rainbow Wahine then won four of the last five points to take Set 1, 25-23. UH outscored Baylor 11-to-4 to end the set. The second set saw UH build as big as an eight-point lead three different times in the middle of the frame, the last coming at 21-13. But Baylor fought their way back into the set on a 7-0 run. UH was able to hold off the Bears by scoring four of the last five points—including the last three straight points to capture Set 2, 25-23 on a Casey Castillo kill. Taking their momentum into Set 3, Baylor raced out to an early lead and then just pulled away to take the frame, 25-14. Hawai’i hit .000 in the set, with eight kills and eight errors in 34 attacks, while Baylor hit .371. Hawai’i held the lead through much of the fourth set. But Baylor would keep fighting to keep things close. UH went on a 5-to-0 run early to take a 8-6 lead. The ‘Bows would go on to lead by three at 19-16. But Baylor came storming back, going on a 6-to-2 run to leapfrog UH to a 22-21 lead. The teams were tied at 22, 23, and 24 before the Bears scored three of the last four points, including the last two consecutively to even the match at 2-2 with a 26-24 Set 4 win. The fifth set was full of momentum swings for both teams. Baylor jumped out to a 4-2 lead on a 4-to-0 run. Hawai’i then scored the next five-straight points to take a 7-4 lead. Baylor would then score five of the next six points to jump into an on to a 9-8 lead. The two teams would tie then tie each other three more times late in the set, and UH actually served to the match, after Granato recorded her 11th kill to give the ‘Bows match-point at 14-13. But Baylor won the final three points for a 16-14 Set 5 win for a 3-2 match victory. For just the fourth time this season, UH tallied double-digits in blocks with 12.0, but lost the blocking battle with Bears as they recorded 16.0 blocks as team. UH had the edge in digs, 89-to-82, but Baylor out-hit the ‘Bows, .152-to-.063 in hitting percentage and 61-to-53 kills. Baylor’s Shelly Fanning led a trio of players with double-digit kills with match-high 18 kills and with blocks with 10. Hannah Locking had a match-high 31 assists. It was the final collegiate game for seven Rainbow Wahine—Tita Akiu, Casey Castillo, Angel Gaskin, McKenna Granato, Sarah Liva, Faith Ma’afala, and fourth-year junior Natasha Burns.